Our unfinished wood floor registers by Zoroufy come in a beautiful Brazilian Cherry wood to match your home accents. Stain this air register easily to bring out the natural, woodsy look. The unfinished wood floor registers faceplate is 3/8" thick and will drop in easily into your floor opening. Installation for the air register requires no professional help! These unfinished wood floor registers have a steel damper that will open and close off your rooms airflow. Use the air register to control both your heating and cooling needs. 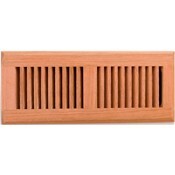 To order the unfinished wood floor registers properly, you must purchase according to your ductwork opening. Our air registers will ship straight to your door or work site for just one low cost! Tip: When ordering this air register, do not measure your existing floor grille. You want to measure the actual hole opening in the floor. The 4 x 12 unfinished wood floor registers will fit into a hole measuring 4 x 12 inches. For other floor air registers offered in oak or in metal, check out all the sizes we have available. These unfinished wood floor registers are a timeless look that will work for any style! Purchase one today.